Moving to a new country is an exciting time, yet will all you have to coordinate and think about it’s easy to become stressed. Rely on SeaCure Moving, the preferred New Jersey International Movers providing seamless international moves from start-to-finish. SeaCure Moving has been in business since 1981 and has helped thousands of families and businesses move overseas. Our top priorities of quality service and customer satisfaction have earned us recognition from the BBB and membership as a ProMover in the American Moving & Storage Association (AMSA). We have the resources and expertise necessary to simplify even the most complex international moves. 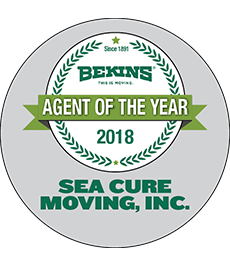 As a Bekins agent, SeaCure has the worldwide network of support necessary to streamline any sized move. As New Jersey International Movers, we will securely pack and crate your belongings before we organize their shipment to your destination efficiently with our freight forwarding services. Our International Relocation Coordinators will assist you with planning the shipment of your household or commercial goods and tracking your items en-route to your new country. If you’re looking for reliable, efficient New Jersey International Movers with years of experience contact SeaCure Moving or fill out our quote for and get a free moving quote today!